The band members are pictured taking a break from performing a at the Cruden Bay Golf Club Christmas ceilidh. An Aberdeenshire band has presented more than £5800 to a range of local and national charities as part of annual donations. Every year the Dark Island Ceilidh Band, which has strong Deeside connections, donates the proceeds of its gigs to organisations nominated by its members and this year distributed more than £5880 to charities including Mental Health Aberdeen, Aberdeen Cyrenians, Friends of Anchor, Alzheimer Scotland, The Gordon Gaitherin, UNICEF UK, Scottish Culture and Traditions, RNLI Lerwick, Befriend a Child, Bloodwise and Ethiopiaid. The band is part of The Dark Island Trust which was created 17 years ago to help promote traditional Scottish performing arts by providing opportunities for new artists to perform in public, as well as donating any proceeds made to charities. Band members come from across Aberdeenshire and play a variety of instruments. Angie Bolt (keyboard and caller) lives in Finzean, Cathy Simpson (mandolin and sound) and Caroline Clark (fiddle) stay in Denside of Durris, Hector Forsyth (fiddle and sound)is from Westhill, Charlie West (whistle and sound) is from Stonehaven, Flora Douglas (fiddle) is from Culter, Brian McCreadie (banjo is from Drum of Wartle and new band member, Tony Hilton (bodhran) is from Drumoak. 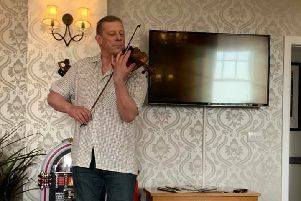 This year they have played for a variety of fund-raising events including the Aboyne Summer Ball and Scottish Culture and Traditions as well as for weddings, birthday parties, conferences and community family ceilidhs. They have also performed for both Finzean Friendship Club and the Drumoak Friendship Club.